Wikiquote is one of a family of wiki-based projects run by the Wikimedia Foundation, running on MediaWiki software. Based on an idea by Daniel Alston and implemented by Brion Vibber, the goal of the project which began as an outgrowth to Wikipedia Famous Quotations is to produce collaboratively a vast reference of quotations from prominent people, books, films, proverbs, etc. and to be as proper as possible in regard to the details of the quotations and also providing the appropriate human reference of the quotation. Though there are many online collections of quotations, Wikiquote is distinguished by being among the few that provide an opportunity for visitors to contribute. Wikiquote pages are cross-linked to articles about the notable personalities on Wikipedia. In July 2004, about 70 subdomains were set up. As of 28 November 2010, twenty-five versions each have more than 1,000 articles. 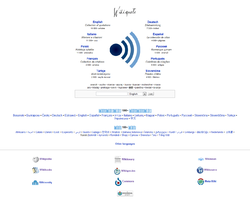 The largest Wikiquote is the Polish project with over 22,600 articles, followed by the English, Italian, German, Portuguese and Russian sites with over 5,000 articles each, and then by the Slovak, Spanish, Bulgarian, Bosnian, Turkish, Slovenian and French (which was restarted in December 2006, after being taken down for legal reasons). Fifty-three language versions have 100 or more articles. ^ "Wikiquote.org Site Info". Alexa Internet. Retrieved 2015-08-01. ^ Ahsan, Hafsa (27 January 2007). "It's all about Wikis". DAWN. Archived from the original on May 4, 2012. ^ "Wikiquote Statistics". Wikipedia:Meta. Retrieved 29 November 2010. This page was last edited 22:49, 17 October 2015 by Wikipedia user JustBerry. Based on work by Wikipedia anonymous user imported>Allixpeeke.